Note: This review was originally published on July 23, 2010. 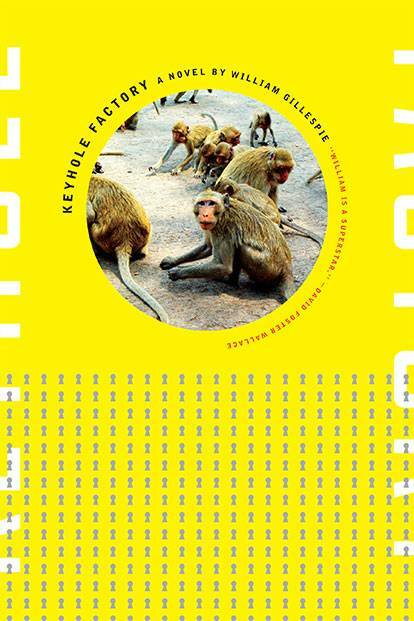 Keyhole Factory by William Gillespie, 368 pages, Soft Skull Press, $16.95. The story of the End of the World in Keyhole Factory begins, innocently enough, at a poetry conference. And that's appropriate, because despite its format as a novel (and also its novel format, but more on that in a minute), Keyhole Factory is poetry at its heart. It suggests, nudges, and paints blurry, horribly beautiful word pictures more than it tells, and it never uses straightforward prose where an allusive fever-dream will do. It is, by turns, bewildering and gorgeous, maddening and profound, and at the end of the day, it's a winner. Let's focus on the gorgeous for starters. Rather than named or numbered chapters, each section leads with a glyph reprinted from Handbook of Pictorial Symbols by Rudolf Modley. The images sometimes accurately foreshadow what's to come, and sometimes they don't have much bearing on the action, but they certainly help set the mood. Also notable is Keyhole Factory's innovative text formatting. For instance, one chapter has all the text justified in circular "bubbles," while another charts the course of the outbreak of a global plague by splitting the stories of patients Zero, One, etc., into multiple columns on the page as the disease spreads. Sometimes it can be hard to follow — like the chapter that simultaneously follows eleven conversations on different communications channels — but generally, the design details are welcome and contribute to the story. Sure, it looks good, but what about that story, you ask? Well, that's a bit complicated. In an alternate present not too dissimilar from our own, the U.S. is at war with China, the Real News Network delivers shiny fictions in the place of actual news, and a poet-astronaut sends increasingly frantic verse back to Earth from beyond Pluto, while his ex-wife develops a super-virus (the "bad idea") in a quasi-governmental lab. Got all that? Because things get a little fuzzy from this point forward. A whole different cast of characters who survive the inevitable outbreak are introduced (some of whom are holdovers from the companion novel Steal Stuff From Work), and Gillespie purposely withholds a lot of the what's, when's, and where's to keep the reader off-balance. Much of the action happens offscreen, with the characters left to react. It's a complex mood piece more concerned with the mental strain of isolation and scarcity, and with creating vivid, impressionistic portraits than with any triumph of the human spirit. By shaping many small stories in place of some larger narrative, Keyhole Factory makes a worldwide epidemic seem almost claustrophobic, which is quite an accomplishment. Take the pockets of rural desert dwellers who begin a cashless, somewhat utopian society After the Revolution, for instance. Even they aren't given many moments of peace, as they're terrorized by a sports-car driving trained killer who's picking them off one settlement at a time. Things are a little better in the "City of Sutures," which is being disinfected and repainted, brick by brick. It often seems like there were several books' worth of characters and stories in this single volume, and when I reached the end, I wished that some of them could have had more time and space to develop. It's a powerful book, though, and one that rewards the reader's patience with economically-written shocks and thrills, as well as plentiful food for thought on our current state of being.